Local News - what will asbestos-linked cancer teach us about asbestos? What should the recent death of a lady with asbestos-linked cancer teach us about asbestos? Last year, a Northampton woman died after a short battle with cancer that could have been caused by asbestos. It was an out-of-the-blue illness that was sudden – but could it have been due to asbestos exposure at home or workplace? Forget what you think you know about asbestos. It’s a pretty historic substance, which was once lauded as a versatile, strong and heat-resistant building material, but has been linked to the cause of mesothelioma cancer, lung cancer and asbestosis. The material was used widely in construction and can still be present in buildings built or refurbished before the year 2000. The worrying thing is that it can take up to 50 years for mesothelioma symptoms to develop. The lady who had potential asbestos-linked cancer also worked as a gas pipe fitter, one of many occupations where workers can come into contact with asbestos at some point. The UK Government website has a handy list of occupations where tradesmen might be exposed to asbestos. However, mesothelioma does not just reserve itself for tradesmen and women: the Institute of Cancer Research and the London School of Hygiene and Tropical Medicine released a report in 2009 which revealed suffers of the disease were exposed to “environmental asbestos exposure”, meaning the “normal occupation and weathering” of buildings. The reach of asbestos, it seems, is a wide one. Because of its wide use in construction – both residential and commercial – it can be found almost anywhere in your property, from decorative ceilings and ceiling tiles, to asbestos cement water tanks and downpipes. Most commonly it was used as “AIB” or “Asbestos Insulating Board”, and can be found in the places around the home where insulation would sit – walls, lofts, and ceilings, and it is even in the Houses of Parliament. It can be removed from your property by licensed contractors who will safely get rid of the material. These licensed workers are an unfortunate necessity as asbestos shouldn’t be disturbed – this is when it becomes dangerous – and it also has to be handled in a certain way. Different asbestos products also require different types of handling as they pose different levels of risk. For example, asbestos pipe insulation is a lot more dangerous than asbestos cement. What are the key things to remember? Asbestos related cancer is responsible for around 5,000 deaths per year. Although asbestos is a dangerous substance, it only becomes a hazard when it’s disturbed. In the ideal world, safe removal of all asbestos would be the best solution, however this is impracticable to do. The cost of asbestos removal and then further reinstatement / replacement of removed items costs can be significate. What should be remembered is that asbestos only becomes a hazard when it’s disturbed. What should be implemented is safe management of the asbestos materials to prevent damage and disturbance. This will include regular condition checks on the materials, adding protection (sealing or over boarding) where required and ensuring people now where the asbestos materials are located. 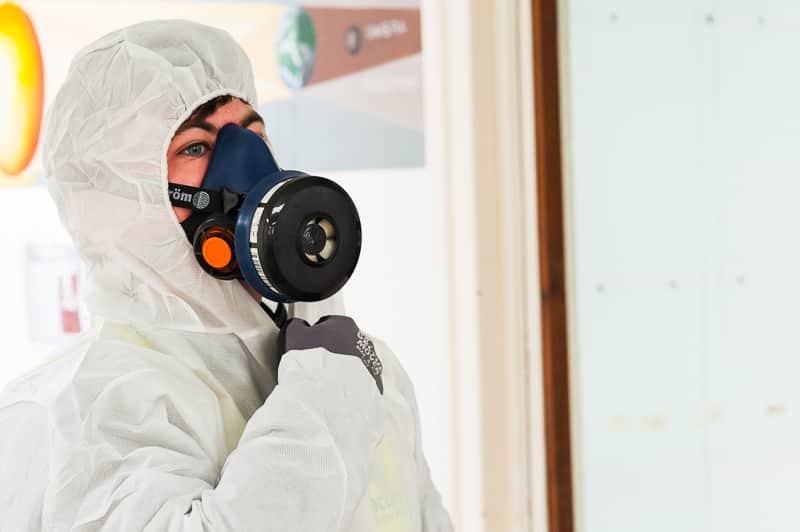 If you need to disturb asbestos in your house or even your place of work, you can contact our team of asbestos specialists by clicking here.